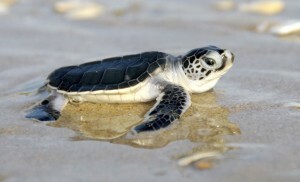 Adult green turtles are unique among sea turtles. They are the largest of all the hard-shelled sea turtles, yet have a comparatively small head. Additionally, as adults they eat only plants. According to NOAA Fisheries, these herbivores feed primarily on seagrasses and algae, a diet that is thought to give them their greenish-colored fat, from which they get their name. The Florida sub-species of Green Sea Turtle population is in recovery and has experienced a record year for sea turtle nesting! In 2015 there were 14,152 green sea turtle nests in the Archie Carr National Wildlife Refuge, up from only about 200 in 2001. David Godfrey, executive director of the Sea Turtle Conservancy, led tours during the nesting season, guiding small groups along the beach at night without lights in search of turtles coming out of the water to lay eggs. 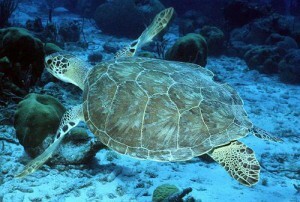 He stated, “From any spot on the beach during the peak of nesting, we might just within eyesight see maybe 10 turtles. And imagine, all these turtles are approaching 300 pounds each. Luckily they don’t move very fast,” he said. “We literally found ourselves at times pinned down by turtles. That’s a phenomenon we have not seen before in Florida”. The recovery of this population is thought to be due, in part, to the creation of the wildlife refuge itself, which was established in 1991. This hopeful example of a growing sea turtle nesting area is a reminder of the value of land conservation!